He got there early, parked his car and got out. "That's where I always sit! You took my place!" the visitor stood up, and his appearance began to change. PayPal will never let anyone take your place. They are the FREE and SAFE way to handle online transactions. You could even use them to donate to your favorite forwards site. 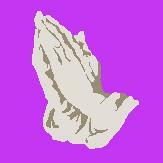 Click on the praying hands to return to ReligiousForwards.